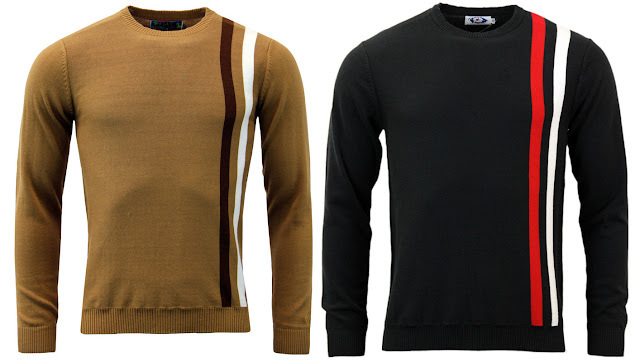 Style of the week is the ace 'Action' racing jumper from Madcap England. The classic Mod 'Action' jumper was first available in black with red and white stripes. Due to its popularity it is now back for AW16 in a fab caramel colour way! An icon that will never go out of style. Simple Sixties Pop Art styling with Keith Moon overtures, the 'Action' Racing Jumper is a Mod Clothing masterpiece and a staple of the Madcap England range. Featuring ribbed trims and awesome contrast twin racing stripes. This particular incarnation with Retro 1970s colour palette adds a subtle yet striking addition to the 'Action' racing jumper range. Perfect for Autumn, get yours now!